As a SCUBA diving instructor, dive shop manager and lover of all things underwater I am often asked the question; where is the best diving? In addition to being active in the world of professional diving, I am also a committed traveler and avid recreational diver, but, alas, I have not yet seen it all. For this reason I, like many before me, have often sat before the all-knowing wonder that is the World Wide Web in search of an answer. Sadly, while the internet has a lot to say on the subject, I find myself repeatedly disappointed with the hundreds of unimaginative “top ten” lists and predictable cataloguing of the obvious choices. There are the sure-to-be crowd pleasers; the Galapagos, the Maldives, the Red Sea, and the less-than-stellar regulars, Belize, for instance, whose place on these lists I have trouble understanding. Sure we would all love to dive the fishbowl bonanza that is the Cocos Islands, but what if you can’t afford the $5,000 liveaboards that many of these must-see destinations require? What if you want something new, something different, something not so expected? In my quest for the ultimate diving experience I have spoken at length with experienced customers, newbie divers and the professionals with whom I work and play. I have concluded, perhaps obviously, that the answer to “where is the best diving?” is relative. Where a career diver may relish in the euphoria that is a good muck dive, a novice may see only sand, and while a happy vacation diver stares in awe at the manta rays soaring overhead his dive guide has likely got his nose to the coral in search of some microscopic abnormality in neon slug form. To each his or her own. So here are a few different lists, which I have compiled based on my own experiences, as well as those of my co-workers and customers. These incorporate some lesser known, but impressive, dive regions as well as interesting one-off oddities and suggestions you won’t automatically find in a Google search for the “top ten best dive sites”. East Timor – Due to years of armed conflict this tiny new nation, which has only recently opened up to tourism (and has been virtually untouched by divers) has not yet made it onto the must-dive lists. However, it’s location in the coral triangle puts East Timor right up there with heavy hitters like the Philippines, Indonesia and Australia in terms of creature life and abundance. 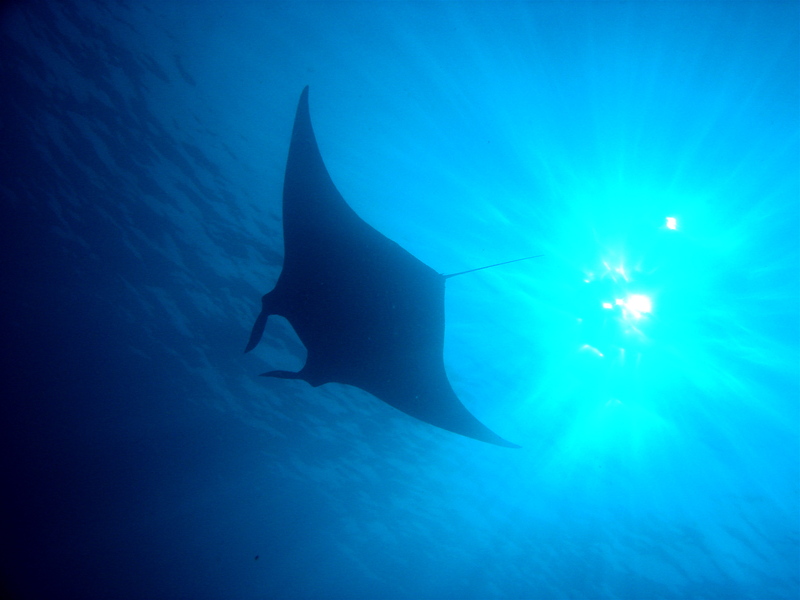 It also offers pristine sites with very few divers and some of the friendliest local guides around. Togian Islands – The Togian Island Archipelago is in the Gulf of Tomini in Sulawesi, Indonesia. While dive professionals and macro enthusiasts may be well acquainted with the name, it is relatively unknown to the majority of recreational divers. The area is home to some of the world’s strangest, brightest, most stylishly creative creatures. 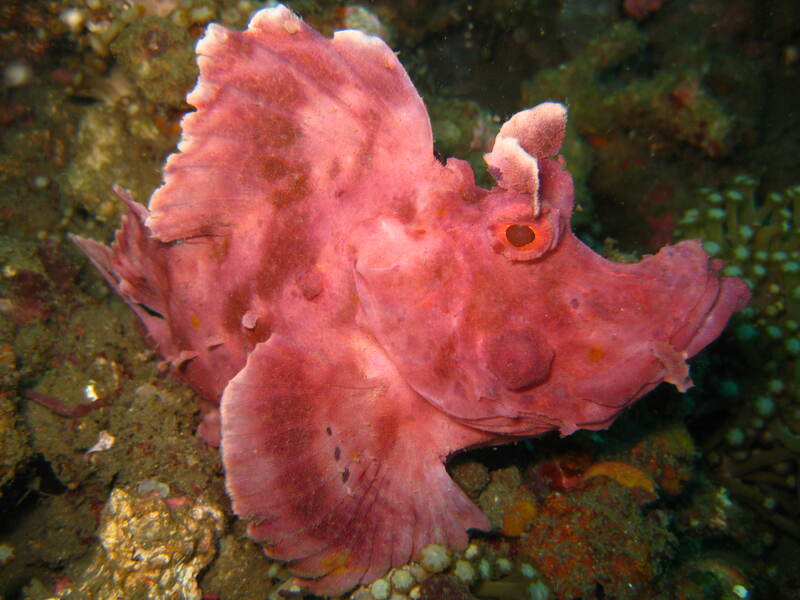 Bring an underwater camera and keep your eyes peeled for the hairy, the glowing, the fluorescent and the miniscule. Okinawa – This is a somewhat conflicted recommendation in light of the Japanese government’s horrendous disregard for ocean sustainability, still the Okinawa area boasts a plethora of easy-to-get-to dive sites, beautiful cave and wreck dives and copious amounts of nudibranchs as well as other interesting critters for which many flock to Southeast Asia. It should be noted that when visiting Okinawa, it is best to opt out of enclosed whale shark diving or a trip to the aquarium where up to 4 of the creatures are entrapped in a large tank. Whale sharks are migratory animals and should be left to roam free in their natural environments. Mozambique – Sharks of every description, manta rays all year round and the occasional humpback sighting are just a few of the things that make this southern African nation stand out as a top dive destination. Here you will not only find the big guys but the little stuff too. 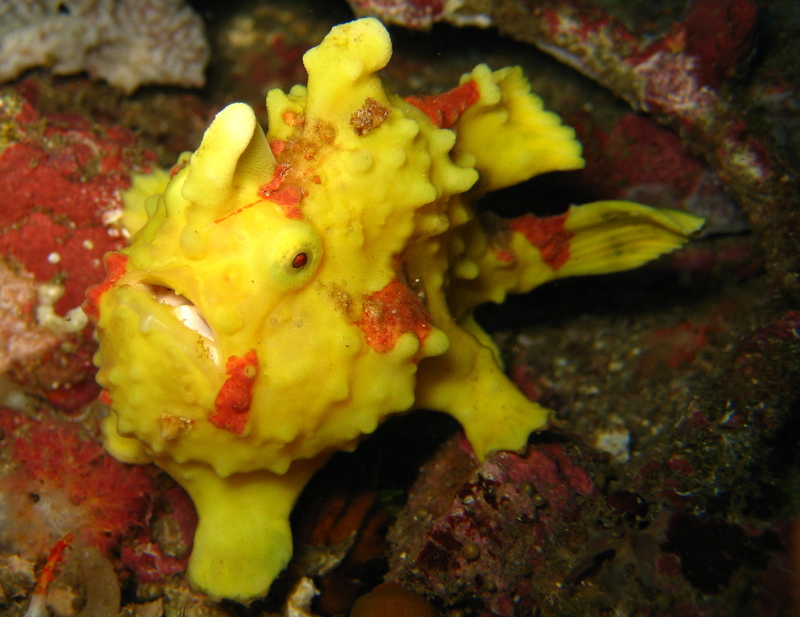 With an abundance of macro life, in addition to all the usual suspects, you are sure to have some great dives. New Zealand – Want wrecks, drop-offs and sub-tropical reefs with great visibility? How about kelp forests, schooling fish, dolphins and whales? If that’s not enough, what about catching a glimpse of the spectacular Leafy Sea Dragon? New Zealand has an immense variety of life and wonder and was considered by Jacques Cousteau to have some of the world’s most interesting diving. St. Lawrence River – Try river-diving in what some call the freshwater wreck capitol of the world. In this upstate New York river you will find numerous wrecks, many dating back to the 1800’s, accessible from both land and boat. The area also promises great visibility and some of the best freshwater diving in the world. Morehead City – You will find all sorts of wrecks up and down the North Carolina coast, from U-boats to civil war wrecks, sail boats to fishing vessels, tankers, freight ships and more. And the added bonus? In addition to the more than 50 wrecks sunken in its waters, the North Carolina coast is also home to a variety of shark species, the most notable of which is the commonly sighted, fearsome looking, but relatively docile, Sand Tiger Shark. No chumming necessary! Bikini Atoll – Bikini Lagoon in Micronesia serves as the resting place for some of the most famous WW II-era naval vessels, many sunk by the US in an attempt to understand the effects of nuclear bombing. There are all types of wrecks here, battleships and carriers, destroyers, submarines, even small transports and landing craft. Untouched by divers for many years, the area also sustains an abundance of sea life both big and small. Silfra Lake – In this Icelandic lake you can dive the rift between the American and Eurasian continental plates. You will not see fish life, but the scenery is stunning and the clear, cold water is a trippy experience. Neptune Memorial Reef – The Neptune Memorial Reef, which is also known as the Atlantis Memorial Reef, is an underwater graveyard of sorts, located just 3 miles off the coast of Key Biscayne in Florida. It is home to hundreds of cremated remains, which make up the world’s largest man-made reef. At a depth of only 40 feet it is an easy and relaxing dive. Homestead Crater – Take a dip in this 55-foot sulfuric dome in Midway, Utah. No fish life here, but it’s an interesting atmosphere with great visibility and bathtub-like 96 degree conditions. Elephant Cave – Elephant Cave in Crete, Greece is filled with fantastic, colorful earth formations as well as the fossilized remains of an elephant including tusk, tooth and vertebrae. I discovered these little lovelies eight years ago while doing my professional dive training alongside an obsessive sea slug enthusiast and have since become obsessive myself. No dive is satisfactory without them, no waters worthy unless they contain a healthy collection of species and specimens. I am baffled by customers who tell me not to point them out and aghast when people aren’t totally enthralled with these glitteringly bizarre, eccentrically unique, drag queens of the sea. 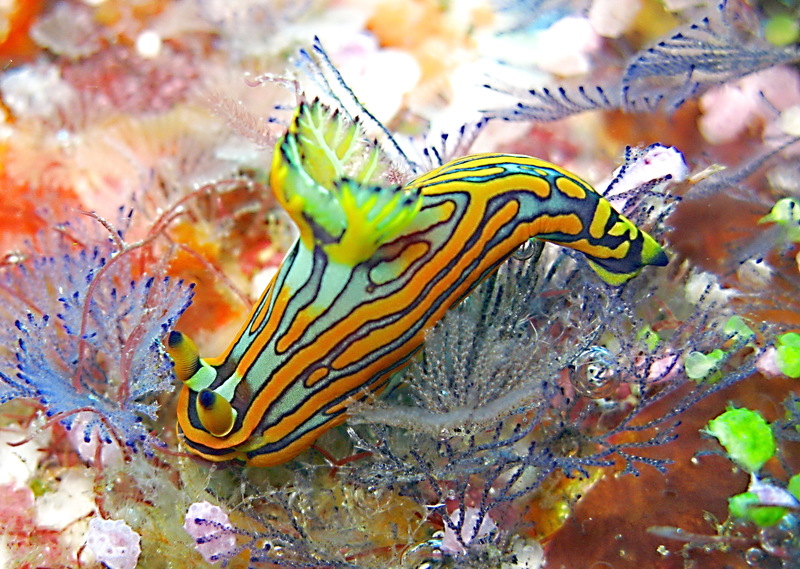 Nudibranchs, or nudis for short, come in many shapes and sizes from tiny millimeter long gooey rice grains to three-pound, foot-long globs of colorful flesh. Not just colorful, each of the over 3,000 species has it’s own lavish dress code. Some prefer a simple yet peculiarly transparent sheath while others go for bright shades of lemon yellow, purple polka-dotted mantles and headdresses in magenta and blue. 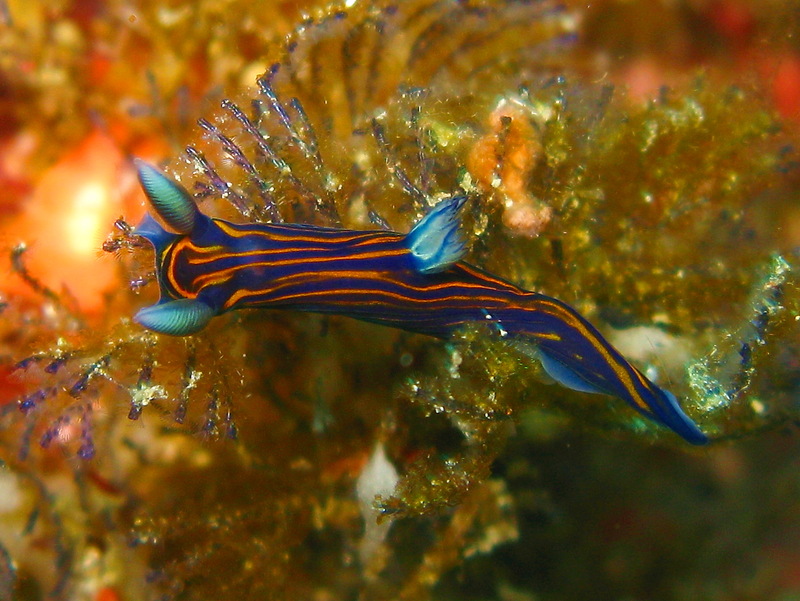 But nudis are cool beyond their colors. 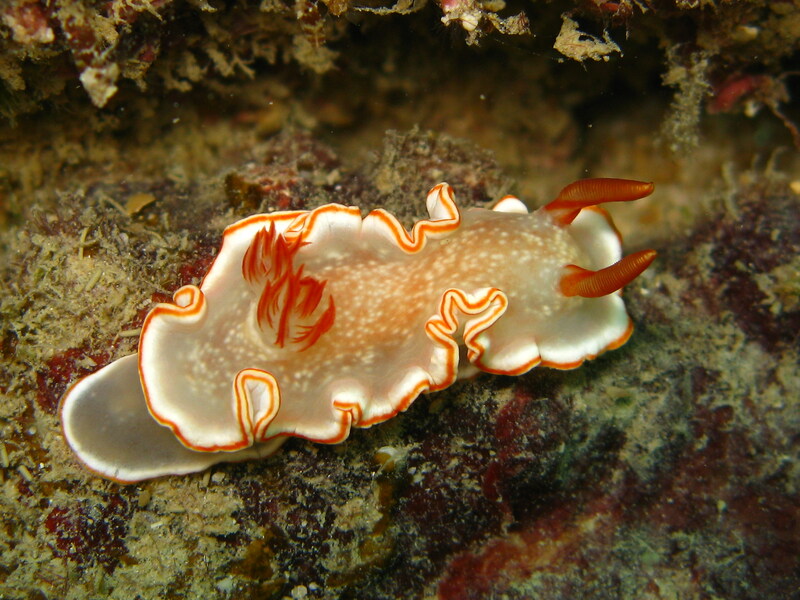 Extraordinary in every way, nudis vary from solar-powered sand crawlers to coral munching “dancers”, mobile via a strange repertoire of wiggly, graceful undulations. They are also hermaphrodites, cannibals and could hold the secret to curing cancer. But really they are just fun to look at!